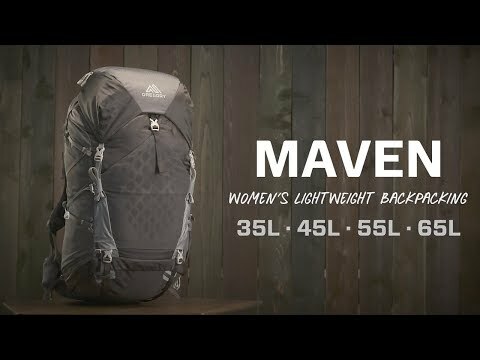 Sidestep heavy backpacks in favour of this light and nimble pack. Moderate storage capacity helps keep you self-sufficient on multi-day excursions. Suspension frame and adjustable shoulder harness offer support for the load. Plenty of pockets keep things orderly. Removable hydration compartment doubles as an ultralight daypack. Made of lightweight yet abrasion-resistant 210-denier ripstop nylon. Aerolon suspension uses an ultralight hollow aluminum frame that is flexible yet supportive. Matrix ventilated backpanel layers breathable mesh over die-cut foam for maximum air flow. Adjustable shoulder harness lets you customize the pack to your torso length. Women's specific contoured hipbelt and shoulder straps are padded with multi-density foam. Access through top or bottom zippered sleeping bag compartment. Floating lid and spindrift collar let you add extra gear. Stretch shove-it pocket on front keeps a shell jacket accessible and isolated from the dry main compartment. Twin waterbottle pockets at the side are low profile. Hipbelt pockets can be repositioned independent of the hipbelt to maintain easy pocket access. Bottom compression straps hold sleeping pads, yoga mats, etc. Shockcord and loops hold your trekking poles or axes. Integrated rain cover stows inside an external zip pocket, which doubles as an accessory pocket. Maximum recommended cargo weight is 23kg.